Sweet Home 3D 4.5 was released on October 22, 2014 with a better support of 3DS file format and other improvements and bugs described in version history. During the past years, the ability to import 3D models at 3DS file format was possible thanks to the Loader3DS software library. Unfortunately, it didn't work so well in some cases, preventing users from importing many 3D models available on the web at that format. Last summer, I decided to reprogram completely this feature inspiring myself from the free C library available at www.lib3ds.org. This lead to a solution that works much better in the version 4.5, even if there are still some issues for some models with parts on which a mirror modifier is applied. But those remaining buggy models are very few now, and you'll be able to import many more 3D models than before from some of the web sites proposed in 3D models import page. Please keep in mind that this change in the program may lead to some modifications in the way some 3DS models imported in previous versions of Sweet Home 3D are rendered at screen, and that the customization of materials set on furniture at 3DS format in previous versions will be lost in the version 4.5. The size of the texture choice dialog box is now kept in memory for the next time you'll open it in case you enlarged it, and the search filter this dialog box contains is reset once you imported a new texture image, to let the imported texture appear in the list. Trying to place an object on top of another one with the mouse could be tricky sometimes when objects had comparable sizes. That's why a margin of error was added to determine whether an object overlaps an other one, when magnetism is enabled. Thus, it will be easier to place a dryer machine on a washing machine or to create a simple pile of plates. Grouping furniture won't change anymore the order in which pieces where added to the home and drawn in the plan. For example, if you took care to reorder a table and its chairs to let them appear under the table in the plan, this order will be kept in the group. Help in Spanish, Japanese, Portuguese Brazilian, Russian and Polish was updated by Pablo Mayordomo and the new translators Carlos Segura, Chiyoko Miklasevich, Кунаков Антон Юрьевич and ghr424 who contributed to translate the missing texts. Many thanks to them for their contribution. Whether run from its DMG installer or Java Web Start, Sweet Home 3D works correctly under Yosemite once Java is installed in the system, i.e. Apple Java for the installer version or Oracle Java for Java Web Start version. The only issue is that the new look of the user interface elements won't be used in the program, because Java wasn't prepared to respect this look yet. For the Apple Java 6 version still used by Sweet Home 3D installer, I suspect that it will be never the case, but let's hope that Oracle Java 7 / 8 versions will be adapted soon. Once there's more information on this point, I'll bundle Java 7 or 8 in Mac OS X installer if necessary, like it's been done for Windows and Linux during the past years. During the past two years, the money I earned from OpenCandy partnership helped me a lot to spend more time on Sweet Home 3D development. But the offers proposed by this kind of system during software installation under Windows seem to be less and less tolerated by some users (and also some anti virus tools) leading too often to very bad reviews, that's why I did not release any installer with OpenCandy offers this time. To replace this revenue, I decided to propose along with the free version, a paid version of Sweet Home 3D for Windows users on amazon.com that includes all the furniture and textures libraries freely available on sweethome3d.com web site, similarly to the version I've sold on the Mac App Store for one year. At the moment, as only Amazon users living in the US can buy in Amazon Appstore, this paid version is shown only for US users on the download page, but I hope that Amazon will soon make its Appstore available worldwide to let anybody buy this version. In no case, I want to leave the Open Source community or create some kind of proprietary version that would contain special features unavailable in the free version. I'm fully committed to keeping Sweet Home 3D in the free software community, and selling these special versions is a way users seem to accept better than the offer system proposed by OpenCandy and others. 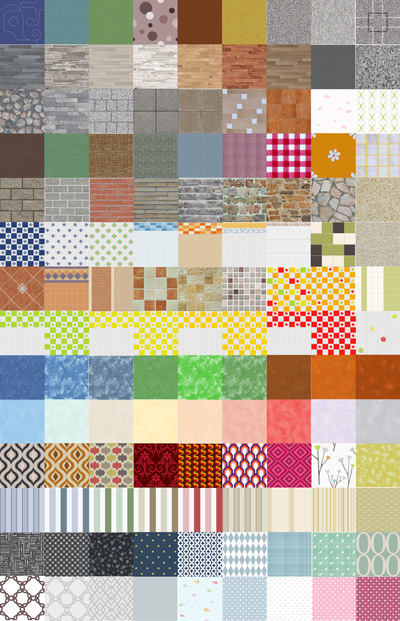 Along with Sweet Home 3D 4.5, textures libraries 1.1 were released with 126 new original textures designed by Scopia. Distributed under Creative Commons CC-BY license like the ones released in February, they cover may kind of needs like parquets, carpeting, tiles, wall papers, sponge painting and exterior walls look. These SH3T files may be installed by choosing Furniture > Import Textures Library... from the menu and were translated in many languages. As the textures import page wasn't updated to welcome these textures yet, note that if needed, a SH3T file is just some kind of ZIP file, letting you extract individual texture images from SH3T files with any ZIP tool. Try to increase the max memory used by the program.